Drummond Ltd. Press Release – Investigation by Ministry of Labor of Colombia | Drummond Company, Inc. Regarding the accident that took place at Port Drummond on March 4th of this year, we in Drummond continue to grieve for the loss of our workers Deiner Rafael Noguera Sierra and Jhon Jairo Mendoza Bolaño. It has been a priority for Drummond to accompany and support Deiner and Jhon Jairo´s families in this difficult time from day one. In terms of the investigation by the Ministry of Labor into the accident, Drummond Ltd. has not been officially notified. Once this happens, the Company will respond to the accusations within the time frame established by the law. The company has been collaborating from the beginning with the appropriate authorities in the investigations, including the Ministry of Labor. Regarding the support for Deiner and Jhon Jairo´s families, they are now covered by Drummond´s special plan that is granted to families of workers who have died in work-related accidents, which includes sustenance payment for spouse and sons/daughters, full health coverage for the family, and full coverage of the children´s education costs up to undergraduate degrees at the Colombian university of their choosing. We have also supported the Occupational Health Committee (Comité Paritario de Salud Ocupacional – COPASO), and since the accident we have been holding meetings with all the union representatives to talk about what happened, listen to their concerns, and work as a team so that this kind of situation doesn´t happen again. Drummond Ltd. has OSHAS 18001 certification. It has a robust safety and health system, which includes a risk analysis of all the positions in the Company, prevention and training programs, risk mitigation, procedures for all the Jobs, top quality personal protection elements (PPE), among other things. 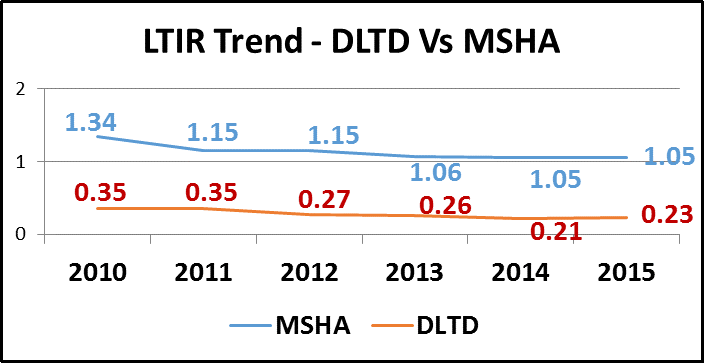 The following table shows Drummond´s Lost Time Incident Rate (LTIR) over the last five years which, when benchmarked with the one reported by the US´s Mine Safety and Health Administration – MSHA, shows that Drummond has had a very good safety performance. We reiterate our support and solidarity with Deiner and Jhon Jairo´s families, as well as our commitment to continuous improvement aimed at preventing this type of incident from happening again. While we work hard to prevent accidents involving any of our personnel, regrettably sometimes these things happen as shown above. When this does happen, we try to make reparation.